Myths often take the place of history, particularly when stories are complex, facts are lacking, and audiences need comfort. This outcome seems to have occurred, and these factors been at play, in the case of the purported ‘Ataturk words’ of 1934. Language and cultural differences and political imperatives have added to the mix. They are lovely words but we really don’t know that Ataturk ever said or wrote them. It detracts from the dignity of commemoration, whether it is in speeches or memorials, if we keep quoting these words and putting his name under them without proper evidence. Doing it again and again, as we have done in Australia and Turkey, just sets in stone what may well be a myth. examples of Australian recognition of the ‘Ataturk words’. The article does not attempt to draw conclusions about who may have said or written what when, though the material, in our view, leads in particular directions. The material also notes where more research needs to be done. Further research may shed a new or different light. The name ‘Ataturk’ (‘Father Turk’ or ‘Ancestor Turk’) is used throughout this article even though he did not take this title until November 1934. Before that he was known as Ghazi Mustafa Kemal, or Ghazi Kemal Pasha or Mustafa Kemal Pasha. ‘Ghazi’ is a term of respect meaning ‘warrior’ or ‘champion’. ‘Pasha’ is ‘knight’. In British and Australian reports in the 1930s Ataturk is sometimes referred to as ‘the dictator of Turkey’ or ‘the Mussolini of Turkey’. Cengiz Ozakinci, born 1954, is a Turkish author, publisher and critic whose specialisations are history, linguistics, semantics, etymology and the philosophy of art. Since 2009 he has been a columnist for the Turkish cultural journal, Butun Dunya, published by the Baskent University of Ankara. He has published more than 250 articles and 11 books. These articles appeared in the March and April 2015 issues of Butun Dunya. Honest History thanks Mr Ozakinci for his co-operation in producing this research note. ‘The words “There is no difference between the Mehmets and the Johnnies” engraved on the 1915 Gallipoli monuments do not belong to Ataturk. Part II’, Butun Dunya, April 2015, pp. 9-15. 1. Advertiser (Adelaide) 11 November 1938. Ataturk obituary. 2. Anzac Day Commemoration Committee, ‘The Gallipoli Fountain of Honour’ (Arthur Burke). 3. Ataturk Today website. Turkish language website (some English) which includes photographs of the scenes on 10 November 1938, when Ataturk died, and 10 November 1953, when his remains were moved to the Ataturk Mausoleum in Ankara. The latter photographs give an indication of the atmosphere of intense public grief at the time former minister Sukru Kaya gave his interview to Yekta Ragip Onen, which was reported in Dunya on 10 November 1953 and reproduced by Ulug Igdemir in 1978 (see below, section 12). 4. Australian Dictionary of Biography, ‘Alan J. Campbell’ (Keith Moore). 5. British Newspaper Archive. Searched around key dates. 6. Courier-Mail (Brisbane). Oliver Harvey, ‘Ghosts at Gallipoli’, 25 April 1964, p.2. Recalls the Bill Yeo visit to Gallipoli in 1960 and the words of the official Turkish statement his group heard. The gist of this material is on page 83 of Davis (below, section 9). Heavy rain over the city sent many guests and spectators to cover when the Gallipoli foutain [sic] of honour near Roma Street Station was turned on officially yesterday. But just as many, like the Premier (Mr Bjelke-Petersen), left, the Governor’s private secretary, Commander David Robertson, and Gallipoli veterans stayed and got wet. 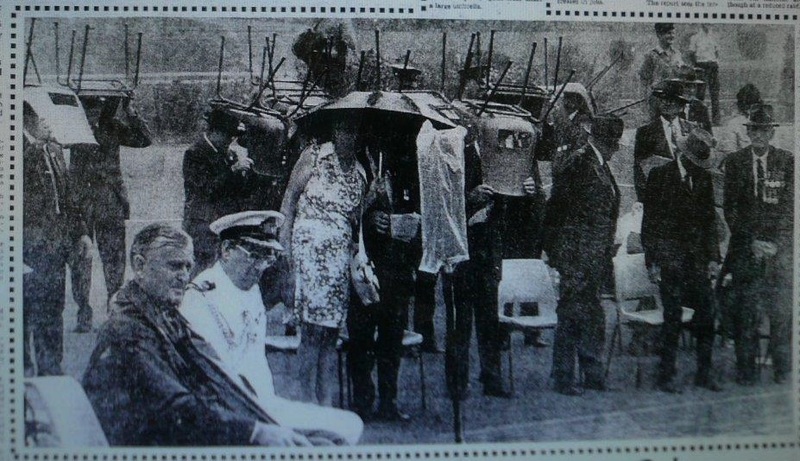 The picture was taken as the fountain committee chairman (Mr. Allan [sic] Campbell), spoke from under a large umbrella. 8. Daily Mail (Brisbane). 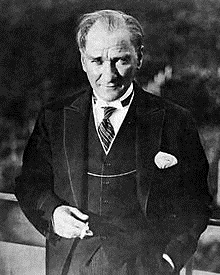 Mustafa Kemal Pasha, ‘Worthy foemen’, 25 April 1931, p. 13. Expresses respect for Anzacs as fighting men, pays tribute to the dead, hopes for peace. The article is attached in two parts here and here. 9. 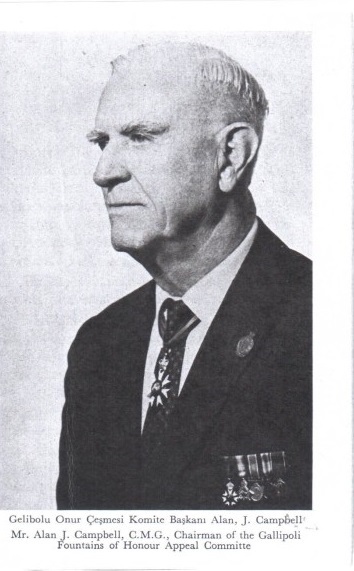 George Frederick Davis. ‘Anzac Day meanings and memories: New Zealand, Australian and Turkish perspectives on a day of commemoration in the twentieth century’, PhD thesis, University of Otago, 2008. Davis draws conclusions about what happened in 1934. In doing so, he does not cite explicit evidence from the Hamilton papers (see below, section 10), seems not to have seen a full copy of Hope (see below, section 11) and includes similar speculations to Jones (see below, section 13) about political motivations behind translations. On the other hand, Davis may have had doubts, because he uses the terms ‘traditional orthodoxy’ and ‘variations’ in relation to the ‘Ataturk words’ and says the words were ‘allegedly’ said in 1934. He also notes the lack of reference to the ‘Ataturk words’ in newspapers of 1934 and in four biographies of Ataturk. He advances reasons why the purported speech was not widely reported but seems not to have sufficiently considered the possibility that the speech was not made at all. 11. Stanton Hope, Gallipoli Revisited, The author & Royal Naval Division Officers’ Association, London, 1934. A chronicle of the Duchess of Richmond tour. It contains no evidence of Minister Kaya giving a speech in 1934, though it includes a photograph showing Kaya was present at a wreath-laying at Lone Pine during the tour. Hope does not mention Kaya in the text. 12. Ulug Igdemir, Ataturk ve Anzaklar (Ataturk and the Anzacs), Turk Tarih Kurumu Basimevi (Turkish Historical Society Publishing), Ankara, 1978. This is a basic reference; in Turkish and English. Igdemir dedicates the booklet to Alan Campbell in Brisbane. The reproduction of Kaya’s 1953 interview and the Igdemir-Campbell correspondence are particularly important. We have found no evidence of the ‘Ataturk words’ from an earlier date than the date of this interview. Put another way, the version of the ‘Ataturk words’ that has come down to us derives from Igdemir’s booklet, even down to the inclusion of Campbell’s ‘Johnnies and Mehmets’ words in the English translation when there is no equivalent sentence in the Turkish. We have found no evidence (yet) to explain why Campbell inserted these words. Nor have we found (yet) whether there was any reaction when Campbell circulated to the Australian media a translation of an April 1978 article by Igdemir on Ataturk and the Anzacs, nor what steps after 1978 led to the appearance of the Ataturk words on the Ari Burnu and Ataturk memorials in 1985 and many other places afterwards (see below, ‘Memorials’). I am in the house of Mr Sukru Kaya, a close friend of the Great Soldier, Great Reformer and Great Man, Ataturk. On the eve of the anniversary of Ataturk’s death I am listening to Sukru Kaya’s reminiscences about Him … As he [Kaya] gets more emotional, new memories come to life and I ponder in my incapacity for conceiving the greatness of the Great Man. Onen describes how Kaya recalled that Ataturk instructed him on what to say in the purported 1934 speech. Onen then describes how Kaya says he gave the speech and was congratulated for it. Yet, this statement in fact belongs to the Great Soldier. This Great Soldier does not nourish inimical sentiments towards the nations he has just yesterday defeated, instead stretching his friendly hand with the most humane and civilized feelings. And he has made Mr. Sukru Kaya, Minister of Interior, express such feelings of his own. “Peace at home and peace abroad” … It is obvious that these watchwords of Ataturk were inspired by the thought that hostilities among the nations of the world should be forgotten. There are two other important features in Onen’s report of what Kaya told him. First, Onen says ‘Kaya was to leave for inspection in the district of the Dardanelles’. This sounds more like the circumstances of Kaya’s 1931 visit (as described in Ozakinci Part I) than those of the purported 1934 speech. Secondly, there is no mention of Kaya speaking to a visiting delegation. Ataturk simply says: ‘You will speak as though addressing to the whole world’. Igdemir claims the purported speech was then widely reported because ‘a few foreing [sic] newsmen who had been present in the locality recorded this statement’. Note, however, that Davis (see above, section 9) found no evidence of this reporting; nor did we in our search of Australian, British and New Zealand newspapers. Kaya was one of Ataturk’s closest supporters while Ataturk was alive but was a long-time opponent of Inonu. Kaya’s political career had ended on Inonu’s accession to power. A reasonable hypothesis is that Kaya’s interview was not only a hagiography of Ataturk, from an old (and elderly) comrade, in a pro-Ataturk newspaper and at a highly charged time, but also a gesture against his old opponent Inonu. One of the most powerful weapons they [the Democratic Party] could use against Inonu [says Erik Jan Zurcher in an article published in 2012] was Atatürk. The Democrats developed a discourse in which they attributed the successes of the Kemalist regime to Atatürk and its faults to Inonu. It could have suited Kaya to have contributed to this discourse and this may have been part of the motivation behind his Dunya interview praising the memory of Ataturk. The words of the purported 1934 speech, as recounted by Kaya, expressed Ataturk’s desires for peaceful relations between nations. We know of no other evidence than Kaya’s, however, that the words Kaya attributes to Ataturk actually came from Ataturk. 13. Adrian Jones, ‘A note on Ataturk’s words about Gallipoli’, History Australia, 2, 1, 2004, pp. 10.1-10.9. Jones has some interesting speculation about translation differences and how Ataturk’s views may have changed between 1915 and 1934. He translates a 1992 Turkish version of the ‘Ataturk words’ without including a reference to ‘Johnnies and Mehmets’ but he assumes that the ‘Johnnies and Mehmets’ words were inserted in the Ari Burnu monument (and other places) by an unidentified ‘fine translator’. Jones describes the Duchess of Richmond delegation as from ‘the Allied War Graves Commission’ – there was no such body – and has Mustafa Kemal becoming ‘Ataturk’ in 1933 rather than (correctly) in 1934. Jones’ article was based on a 2002 talk to the Union of the Australian Friends of Turkey. In preparing the talk and the later article Jones had available to him the full text of Igdemir, in Turkish and English, but he refers only to the pages that give the Turkish and English versions of the ‘Ataturk words’. He refers to Campbell only once (in a footnote, calling him ‘An Anzac’), fails to mention that Igdemir dedicates his booklet to Campbell, and ignores the Igdemir-Campbell letters which are set out in full at pages 43-67 of the booklet. 14. 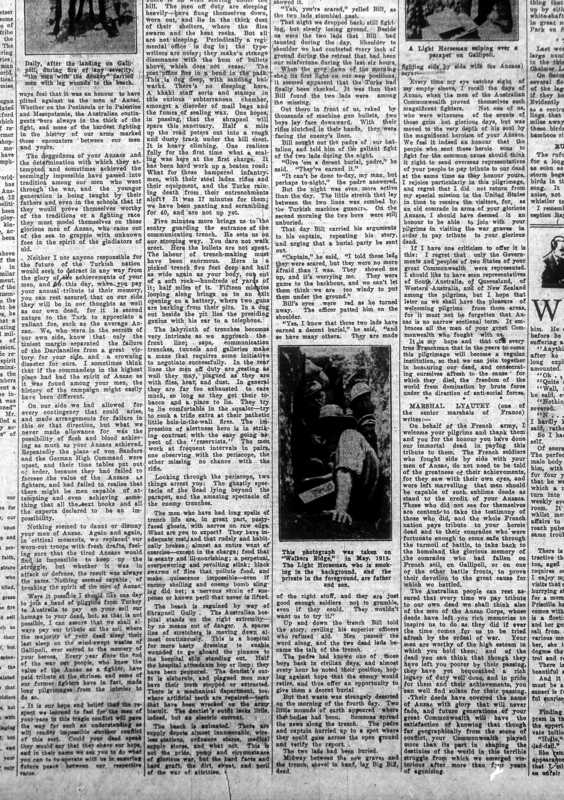 Maryborough Chronicle, Wide Bay and Burnett Advertiser, 25 April 1930, p. 6. Mustafa Kemal Pasha’s praise for Anzacs as fighting men. 15. Papers Past (New Zealand). Searched around relevant dates. 17. 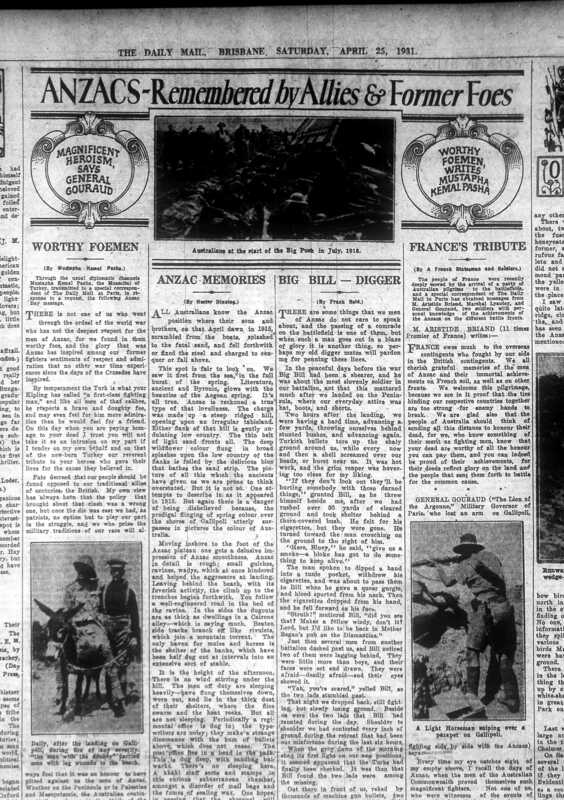 Times Digital Archive 18 April 1934; 26 April 1934; 3 May 1934; 4 May 1934 (about Duchess of Richmond visit; search under ‘Gallipoli’, ‘Turkey’ or ‘Anzac’). Also 11 November 1938 for Ataturk obituary. 18. Turkish Embassy in Canberra website. Gives the ‘Ataturk words’ and a ‘response by an Anzac’s mother to Ataturk’s words’ but provides no source for either. We know the source for the first but the source of the second is a mystery. 19. Turkish Historical Society. 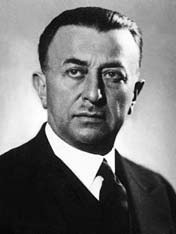 Ulug Igdemir was chief executive of the Turkish Historical Society when he corresponded with Alan Campbell in 1978. The Society had been founded by Ataturk in 1931, was a non-profit from 1940 to 1983 but has been a public organisation within the Turkish Government since 1983. ‘Inscribed in English on the monolith’, according to this official website, ‘are the famous words Mustafa Kemal Ataturk delivered in 1934 to the first Australians, New Zealanders and British to visit the Gallipoli battlefields’. But Ataturk did not ‘deliver’ the words in 1934 (he wasn’t there), he was not ‘Ataturk’ until November 1934, we have found no evidence that there were New Zealanders in the group, there is evidence that only one Australian, Captain Wetherell, was in the group, and the group was not the first to visit. Davis (above, section 9), for example, refers to a visit in 1928 by Allen. There is no indication of why or when the change was made. Elsewhere on this DVA site, the reference is to ‘words sent in 1934 by Mustafa Kemal Ataturk, President of Turkey, to an official Australian, New Zealand and British party visiting Anzac Cove’. The party was not official, though it included members of the International War Graves Commission. Update 10 November 2015: again this reference has been amended to read ‘words attributed to Mustafa Kemal Atatürk, President of Turkey, sent in 1934 to an official Australian, New Zealand and British party visiting Anzac Cove …’ Emphasis added. Gallipoli Memorial, Roma Street Parklands, Brisbane unveiled 4 November 2008; contains elements of the old (unveiled 1978) Gallipoli Fountains (see above, section 7). UPDATE 12 June 2015: Honest History has received a letter from the Ataturk Society of America responding to the Ataturk material placed on our site. Honest History stands by our material and its sources. We have sent the Ataturk Society letter on to Cengiz Ozakinci.